Survivor Pass, Book Five, Redemption Mountain Historical Western Romance Series "The Redemption Mountain series is as good as historical romance gets-vividsettings, memorable characters, love, and lots at stake. Shirleen Davies knowshow to bring the old west to life. You feel as if you've traveled, with thecharacters, to the frontier. I hope there will be more to come!" Book Review He thought he'd found a quiet life... Cash Coulter settled into a life far removed from his days of fighting forthe South and crossing the country as a bounty hunter. Now a deputy sheriff,Cash wants nothing more than to buy some land, raise cattle, and build a simplelife in the frontier town of Splendor, Montana. But his whole world shifts whenhis gaze lands on the most captivating woman he's ever seen. And the feelingappears to be mutual. But nothing is as it seems... Alison McGrath moved from her home in Kentucky to the rugged mountains ofMontana for one reason-to find the man responsible for murdering her brother. Despiteusing a false identity to avoid any tie to her brother's name, the citizens ofSplendor have no intention of sharing their knowledge about the bank robberywhich killed her only sibling. Alison knows her circle of lies can't end well,and her growing for Cash threatens to weaken the revenge which drives her. And the troubles are mounting... There is danger surrounding them both-men who seek vengeance asa way to silence the past...by any means necessary. 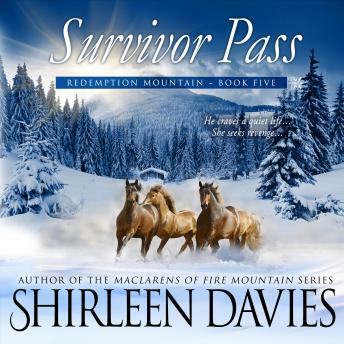 Survivor Pass is book five in the Redemption Mountain historical western romance series.It is a full length novel with an HEA and no cliffhanger.